A grand rosé for a grand vintage. 1999 saw healthy vineyard conditions, after a mild winter. A hot July and August helped véraison develop well, and harvest was carried out in September, which remained sunny and mild. Certain parcels performed very well, particularly with Pinot Noir. To the eye, a subtle coral with nuances of orange, reminiscent of old roses and the result of the prolonged ageing in the chalk cellars. The delicate, joyful effervescence hints at the aromatic complexity of this blended rosé. The subtle elegance of this wine produced from the grands and premiers crus reveals notes of straw and raspberry. The Pinot Noir red wines, 7% of the blend, offer the complexity of mild pepper and sandalwood. A sophisticated wine, full-bodied and generous, this is the very expression of the year 1999, enhanced by more than twelve years of ageing in thousand-year old cellars. The refined texture is reminiscent of the silky rich harmony of hibiscus syrup. Delicate coral hues, with fine, persistent bubbles. Strawberry and raspberry aromas abound along with subtle white pepper, vanilla and sandalwood notes. The palate is infused with strawberry, raspberry and gooseberry, with generous floral notes. The texture recalls the freshness of delicious hibiscus syrup. After the first fermentation, the wine is racked to separate the lees and then undergoes malolactic fermentation to soften the natural acidity. 10% of the blend is vinifed as a red wine. After blending, the cuvée is bottled and selected yeast added to begin the second fermentation. The bottles are placed in the cellar at a temperature of about 10°C to age for a minimum of 10 years before release. 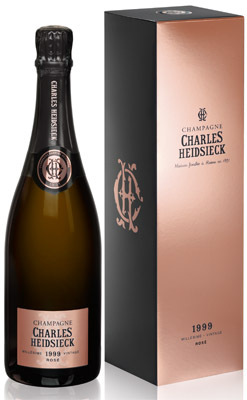 Charles Heidsieck is one of most admired Champagne houses thanks to the unrivalled and consistently high quality of its wines. The current range is one of the most awarded collections of wines in the world, something underlined when Chef de Cave Thierry Roset was named 'Sparkling Winemaker of the Year' at the International Wine Challenge this year. This was the 15th time that Charles Heidsieck's winemaking team had won this award, but the first for Thierry, who has been working at the house since 1988. He took over the reins in 2012, having worked with both the great Régis Camus and the legendary Daniel Thibault. This winemaking legacy, paired with the house's flamboyant history since its foundation in 1851 by the man who would become known as 'Champagne Charlie', makes it a unique offering from Champagne: a house with great wines, champagne heritage and proven quality throughout its range. Charles Heidsieck benefit from the richness available across the entire Champagne region, having built exceptional relationships with the most experienced growers. They select grapes from 120 crus across the Champagne appellation.